Over the years I must have hand clipped many miles of box (in the USA, boxwood) hedging and once the knack is mastered it can be quite therapeutic. The main rule to follow is to remember that it has to be precise for there is nothing worse than a straight, level hedge that is clipped unevenly. It irritates the eye as much as a picture hanging crookedly on a wall. Perhaps the most rewarding design I have created was turning four rather scruffy and unbalanced squares of box into simple but elegant cubes. Yes, it was topiary but to misquote Star Trek “it’s topiary Jim, but…” To begin with, I was faced by the four squares each with a rather ugly and thorny shrub rose growing out of their centres. A consequence of this design was that the box couldn’t be clipped properly and neither could the rose be properly pruned. To create the design the roses had first to be removed leaving a gaping hole in the centre of each square. Fortunately, I had some reasonably tall box plants elsewhere in the garden that I could dig up and replant. I soon discovered that it was impossible to plant them properly without damaging the existing plants. My gamble of just standing them on the earth and then throwing topsoil over them to trickle through the branches paid off. The soil covered the roots and probably much of the lower branches too*. Given a good watering, the plants thrived. Before trimming all the outer edges needed to be marked with string lines for accuracy in cutting. I thought about all sorts of fancy designs for the tops of the cubes and, as is so often the case with design, I decided that simplicity was the key to a satisfactory outcome. Two cubes would have a raised circle and two a raised square. It was essential that these weren’t too high – I didn’t want them to look like a combination of wedding cakes and pimples! I found that it was impossible to mark these designs out and so they were created without guidelines, relying on my eye to tell me where and what to clip. By their second year of clipping they looked as if they had been there for ever. Box is such a versatile plant to use and it is well worth experimenting with them. Below are three photos of how I have used them: the first is the classic edging to a border; the second to bring focus to a set of garden steps; the third a mini-parterre to link two levels in a garden. Your garden doesn’t need to be huge or grand to use box in these ways – the parterre was suitably small scale for a tiny town garden. Have a go at creating your own box design – and if creating a topiary peacock is your thing, that’s fine with me – just don’t aske me to clip it! *This is also a good and easy way to create plenty of new plants for the buried stems will often send out roots. When they do they can be severed from the parent plant to be grown on elsewhere. Imagine it is mid-summer, the morning sun is warming the day and you are gathering handfuls of pretty, multi-coloured and fragrant flowers to bring back into the house. If this sounds like a heavenly dream then read on. The dedicated gardener will need no further encouragement to grow sweet peas but for those less keen on gardening or with little time, they are still the perfect choice. So, even if your idea of gardening is to sit in it with a glass of chilled, white wine, there is a quick and easy way to grow sweet peas for, at this time of year, pots of young seedlings are available from garden centres. They are usually grown in a single pot with a dozen or more plantlets crowded together. They nearly always come as a mix of colours but it is necessary to check that they are a tall-growing and scented variety. Avoid buying the scentless and/or dwarf types, both of which I dislike intensely – why grow these when they should be fragrant and elegant? If the weather is reasonable and the soil not frozen, the seedlings can be tipped out of their pot, teased gently apart and popped in the ground about six inches (15cms) apart. It is beneficial to make sure that the soil in the pot is moist so give them a good drink an hour or so before planting. Sweet peas, being climbers, need something to clamber up: the traditional way are hazel sticks. These are ideal for the sweet peas attach themselves readily to the rough and twiggy stems. If hazel cannot be found, bamboo canes also work well although the young plants may need a little helping hand at first to attach themselves – use any short twigs for this just to prop them up. The canes, which are traditionally placed into a circular ‘wigwam’, need to be about 7-8ft long so that once in the ground they are about 6ft tall. Apart from keeping them watered in dry spells and free from slugs and snails that’s it. They will begin to flower in June and continue (providing you pick them regularly and never allow them to set seed) until the autumn frosts. Incidentally, they grow well up fences too providing they get adequate sunshine. For more experienced gardeners and those that want to enter the local flower show try growing them as ‘cordons’. With this method they are grown in straight rows on bamboo canes or strings to a height of 5ft. A place in the vegetable garden is ideal as they can be readily accessed from all angles without treading on other plants. The spacing is again six inches apart. For the best blooms, remove the tendrils and any side shoots as they appear, also any flower stems with less than four flower buds. With no tendrils for self-clinging it will be necessary to tie the plants to the stakes with string or by using metal rings sold especially for the purpose. When the plants reach the top of the canes and/or the flower quality diminishes, cut the plants free of their stakes and lay them carefully along the ground. Tie in the growing tips to their nearest stake and train as before. The plants will flourish having been given a new lease of life. Sweet peas are readily grown from seed, either sown in pots or the ground in March/April or in pots in October. I prefer to start them in individual pots regardless of the time of year and to protect them from the worst of any cold weather. The seed does have a hard coating and many gardening books advise chipping the individual seeds with a knife. Not only is this hard work and time consuming, I have never found it to be necessary. The seed is both plentiful and inexpensive and if a few don’t germinate does it really matter that much? The growing and exhibiting of sweet peas reached a peak in late Victorian and Edwardian times with many specialist clubs holding shows. With patience and luck, who knows you may become a medal winner at your local flower show? Even if you don’t, you’ll be rewarded by a garden full of colour and a house full of scent. 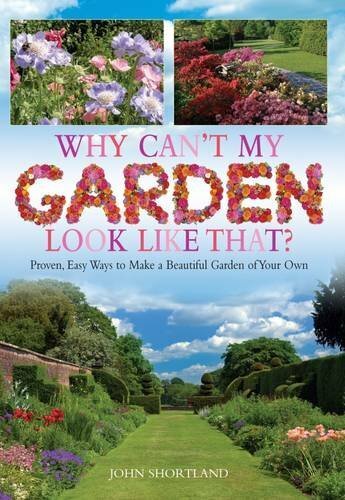 There is lots more no-nonsense advice for gardeners in my book “Why Can’t My Garden Look Like That?” To take a peek inside the covers, click here. The story of the craze for tulips in the 17th century, Tulipomania, is well documented and oft repeated. Suffice to say, that favoured, single tulip bulbs were selling for thousands of pounds/dollars before the tulip ‘bubble’ crashed. Today, we are fortunate in having many hundreds of varieties in an unimaginable range of colours and forms to choose from and at remarkably low prices. Over the years, my work has taken me to gardens of all sizes and styles, from formal parterres attached to country estate houses to ‘pocket handkerchiefs’, to planting thousands in grassland to planting a score or less in pots. It has given me the opportunity to experiment with colour as well as variety. Below are some of my favourites. The formal parterres of this Victorian Italianate garden (by Charles Barry, designer of the Houses of Parliament) required very restrained planting both in colour and quantity. Here, I used the variety ‘Spring Green’, which stands well even in harsh weather conditions. After flowering, the bulbs were lifted and dried off to be replanted again later in the year. It is always desirable to do this as it helps to prevent disease and deterioration of the bulbs. In practice, it is often easier just to leave them and add a few additional bulbs each autumn to bulk up the numbers, especially when time is short. 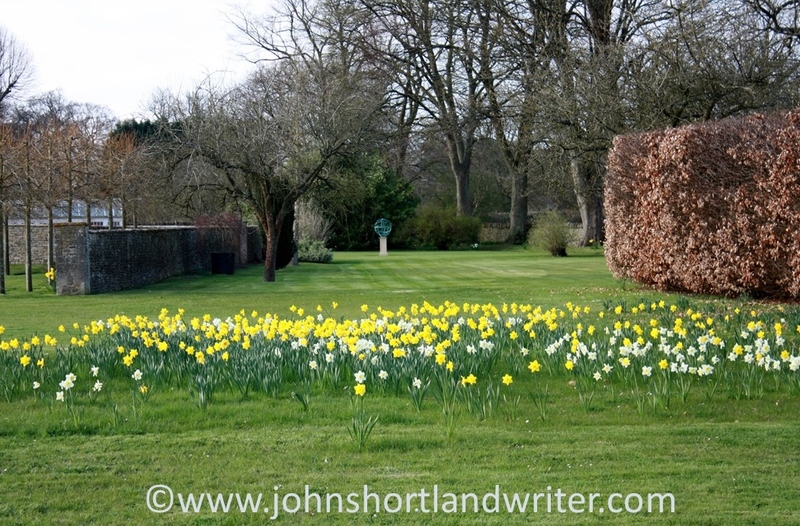 Also in a large estate garden but at the opposite end of the style and colour spectrum, three thousand red (‘Bing Crosby’) and white (‘Diana’) tulips were planted on a meadow bank. 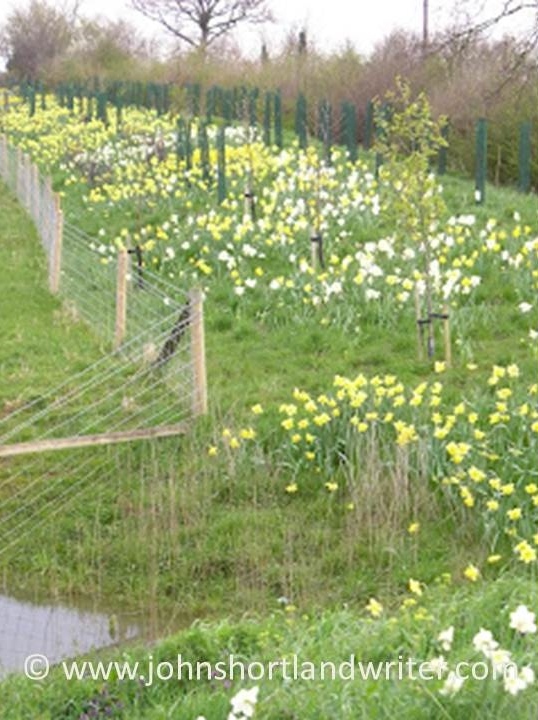 Tulips when planted in grassland deteriorate very rapidly – to maintain this display new bulbs were added each year. However, they do look very beautiful when grown this way – try the almost black tulip ‘Queen of Night’ with blue Camassia bulbs for a magical combination. Even when planting smaller beds, cramming in as many bulbs as is possible between other plants makes for a beautiful display. This stunning border was only one metre wide and four in length but there was still room to have plenty of early colour from ‘Purple Prince’ and the lighter ‘Candy Prince’. For formal displays a bed of tulips takes a lot of beating. They can be single coloured as in this image of pink tulips under-planted with yellow wallflowers (seen at Glasnevin Botanic Gardens in Dublin, Ireland) or mixed colours and planted so densely that no other plants were necessary or desirable (seen at Lismore Castle, Ireland). For those of us with limited space and budgets, tulips grown in pots are ideal for we can still cram the bulbs in to give a magnificent display. The images below show how the first layer of bulbs are placed before a second layer is planted above them. Avoid planting directly over the first bulbs by leaving their tips showing – this will give the bulbs space to develop with much better results. Top up the plants with potting compost and nature will do the rest; it couldn’t be simpler! I like to use the more ‘exotic’ looking varieties in pots as the blooms, by being lifted closer to the eye, give more opportunity to admire their spectacular detail. Perhaps the easiest of all tulips to grow are the wild species* and their varieties. Their delicacy of size belies their toughness. If they like you, they will increase in number year after year. All tulips benefit from being planted as late in the year as possible, November is ideal but even if later they will still flower. The pot grown ‘Green Eyes’ were planted mid-January this year and have just finished flowering. They will be planted in the garden in due course to flower again next spring. In England, tulips are flowering at their best right now: take the opportunity to visit open gardens to see which ones you like best. Make notes of their names so that you can order the bulbs when the catalogues drop through the letter box mid-July. *always ensure that any bulb is purchased from a reputable source and have not been gathered from the wild. The second half of 2016 went just as quickly, if not quicker than the first. No sooner have the nights drawn out than Midsummer Day is upon us and, gradually at first – and then rapidly – the nights close in on us. In England our really warm summer weather does not arrive before July and with luck extends well into October. In bad years it never really arrives at all. In July I travelled just about as far west as is possible in the UK for a few days holiday in Cornwall. Cornwall is a land of contrasts with picturesque, small fishing villages, spectacular cliff walks and golden, sandy beaches. Inland, the scenery is bleak moorland with granite outcrops and the houses appear to squat low in the landscape to shelter from the gales that sweep in off the Atlantic. Luckily, the evening we went to the Minack Theatre was warm with only the lightest of sea breezes. Lucky because the theatre is carved into the cliff face. The idea of Rowena Cade, in the 1930s she and her gardener spent a winter moving rocks and to create a stage and seating. This Herculean effort was more than worthwhile, it was… well, click here to see for yourself. August saw me on the other side of Atlantic Ocean in the American State of Arizona visiting another cliff-face achievement, the Canyon de Chelly. The houses of the Anasazi people were carved out of the sheer rock face hundreds of years ago and can only be reached by precarious toeholds. Today it is the home of the Navajo. The canyon is unique amongst the National Parks of America for it is the only one that is… check this link to find out what. There is nothing like a bit of bragging and September saw me unashamedly showing off about the small lake I created some years back. These days, it looks as if it has been there forever and is home to numerous wild duck, fish and small mammals. Originally a rubbish dump click here to see how it has been transformed. I am always telling you how beautiful our Cotswold Hills are and how lucky I am to live in the middle of the secret valley, away from traffic and houses. In October, I took you all on a virtual tour of the valley. The crab-apple tree lined lane leads to the wonderfully winding river that features on the blog header. After a mile of visual treats the lane narrows even more as it passes our tiny, stone cottage. Occasionally, there is a traffic jam – but rarely by cars. To take the tour again click here. In November we went treasure hunting – looking for fortune in the garden. We didn’t have to dig it all up, only walk around it for we were searching for plants originating in China and Japan. The little-known story of how Robert Fortune, a 19th century dour Scotsman travelled to the for side of the world to fight with pirates before smuggling out what has become one of our most popular drinks is told here. Travels and ancient buildings in Sweden and the south of France, hidden Exmoor, and attracting butterflies to your garden all featured in December‘s review. If that all sounds too exhausting, take a slow, slow canal longboat ride through the stunning scenery that can be found within a few miles of the university city of Oxford (here). 2017 is seeing a lot of changes politically and culturally both here in Britain, in the USA and elsewhere in the world. Some can’t wait for what will happen and others are dreading it. Whichever ‘side’ you’re on, come and escape to Life in the English Cotswolds and the secret valley which will always be, hopefully, a little haven of peace. Best wishes for 2017 and many thanks for your post -and future – support. As always the year has flown by to leave us with much uncertainty and sadness in the world. Fortunately, life in the secret valley continues pretty much the same – it is easy to find relief from everyday stresses when surrounded by unspoilt countryside. Rarely does a day pass when I don’t count my blessings for having had a rural upbringing and the opportunity to continue to live and work in such beautiful surroundings. However, I am no hermit and I enjoy visiting other places – even cities! One city I loved when I visited it some years ago was Stockholm, the capital of Sweden and I began the blogging year with a post about the Skansen open air museum. Skansen was the first tomove and preserve traditional, threatened buildings; it was founded as early as 1873. As well as buildings it also houses a zoo, concentrating on breeding native wildlife for reintroduction schemes including the European Bison which had become extinct in the wild. To see more of the buildings click on the link here. Exmoor is a second home to me and features regularly on my blog. In March, with some misgivings – for why would I want to share such a magical place – I took readers on my favourite walk, one that wouldn’t be found in any guide book. The walk encompasses all that is best on Exmoor: open heather moorland, deep wooded combes, rushing streams and traditional pubs. 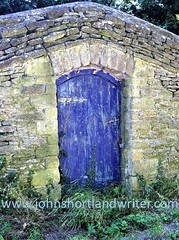 It also passed the door of the hill farm where I turned up as a lad looking for work after leaving school. I was taken in and cared for – and made to work hard – and, well read the story by clicking on the link here. April saw me back on the Continent (as we Brits call Europe). This time in the south of France visiting the ancient town of Lombez. It is far from the tourist routes and we discovered it quite by chance. With its ancient, timbered buildings and wonderful, brick built cathedral it deserved a longer visit than we were able to give it. An excuse for a return trip, perhaps? In the meantime, you can visit it by clicking on this link here. If April saw us travelling slowly through France, May saw us travel at an even slower pace – by longboat on the Oxford Canal. Passing through traditional buttercup meadows – we were miles from the city of Oxford – and in glorious sunshine it was the perfect way to relax as well as to see the wildlife that seemed oblivious to our passing. Click on the link here to see more. Our native butterflies struggle to thrive but I have been fortunate in living in places where they prosper reasonably well. As a gardener, (both my hobby and my profession), I probably see more than most and in June I wrote about the species that visit gardens. See how many you can identify in your own garden by clicking on the link here and don’t forget to record them with your local conservation trusts or online. 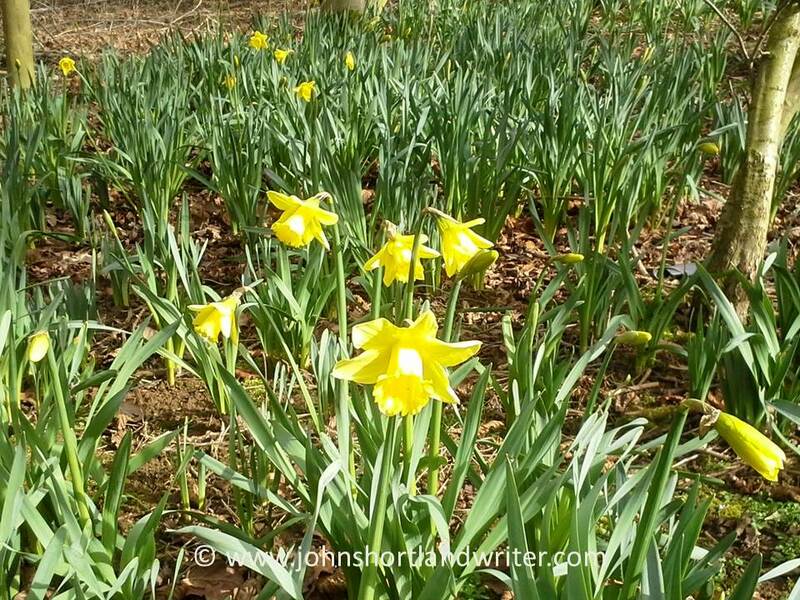 If you want to see, as Wordsworth did, a ‘host of golden daffodils…beside the lake, beneath the trees, fluttering and dancing in the breeze,’ in your own garden now is the time to plant them. What’s more, you don’t need a lake or rolling acres to have a spectacular show. The secret is to plant them in quantity and with a little thought on position. 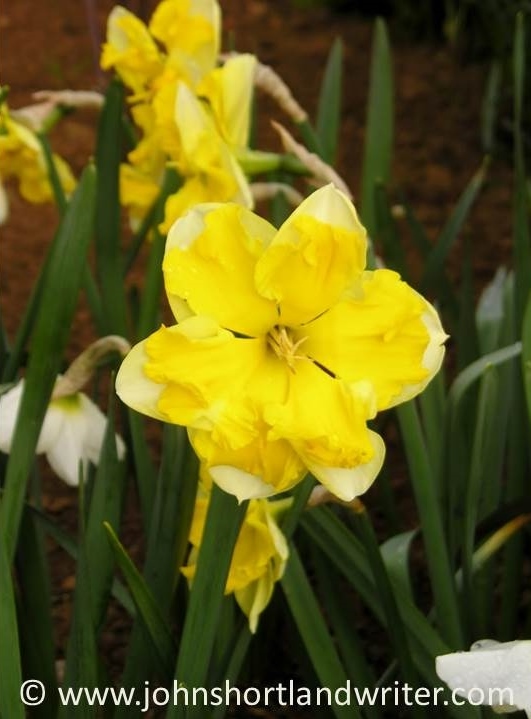 Daffodils (Narcissus) are incredibly easy to grow for every full sized bulb that you buy already has next spring’s flower formed within it. All you have to do is pop them in the ground as soon as possible after purchase and nature does the rest. A general rule is to plant any bulb twice the depth of its height: so if your bulb is two inches high, your planting hole needs to be four inches deep. When they are tucked safely below ground at that level the bulbs aren’t so likely to get damaged when weeding. To get the ‘host’ look don’t plant singly or in tiny groups of twos and threes. Think big, think twenty-five, fifty or even a hundred or more. 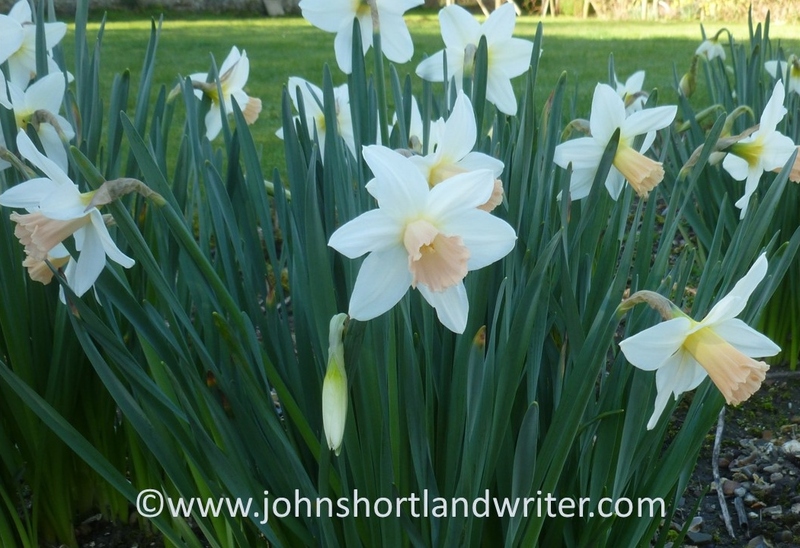 This may sound an expensive option but daffodils are readily available in bulk mail order and many garden centres offer a ‘cram as many as you can into a bag’ deal. It is worth remembering too that the bulbs will continue to increase in quantity and flower for many years making them incredibly good value for money. Because daffodils flower early in the year, before most other plants in the border have got going, it is not necessary to plant them at the front. If they are planted further back, later their dying leaves will become hidden by spring growth. You will find that when planted too far forward, they are both unsightly and a nuisance. 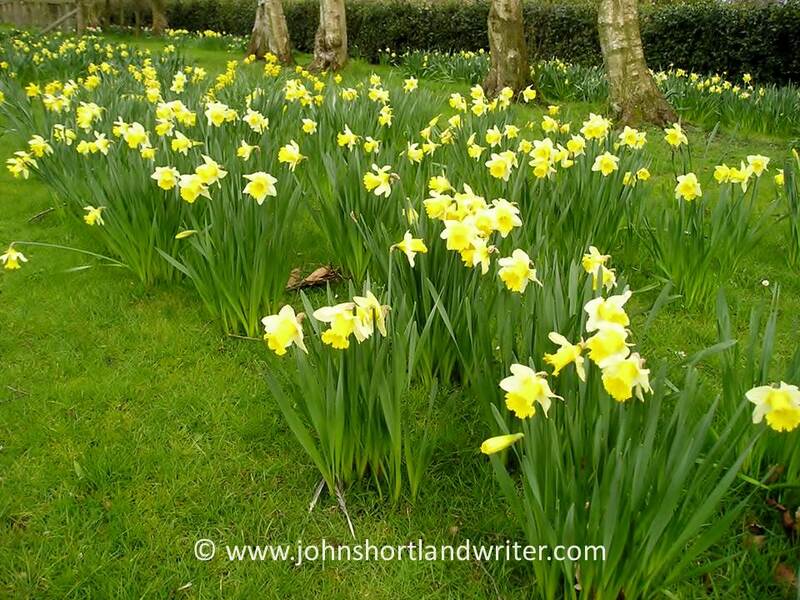 One of the best ways of growing daffodils is to grow them in grass or under trees – just as Wordsworth saw them. The simplest way to do this is to simply throw the bulbs and plant them where they fall. Some will land very close together and some further apart which makes them look as if they have been growing there forever. Make the throw gentle, a cross between underarm cricket and bowls – you’re not trying to win the Ashes. In grass, the bulbs will be easier to spot if you mow the grass as short as possible beforehand. Which varieties to select is only difficult because there is almost too much choice. For naturalising I tend to select three standard varieties that flower at slightly differing times, thereby extending the flowering period. In the borders I just choose those varieties that I fancy. Although daffodils are best planted during August and September, I usually find I’m too busy with other garden tasks then. I have found they can be planted right up to December without a problem providing wintry weather hasn’t closed in. If the thought of planting large quantities sounds rather daunting remember you can always plant year after year until you’ve achieved the aimed for look. 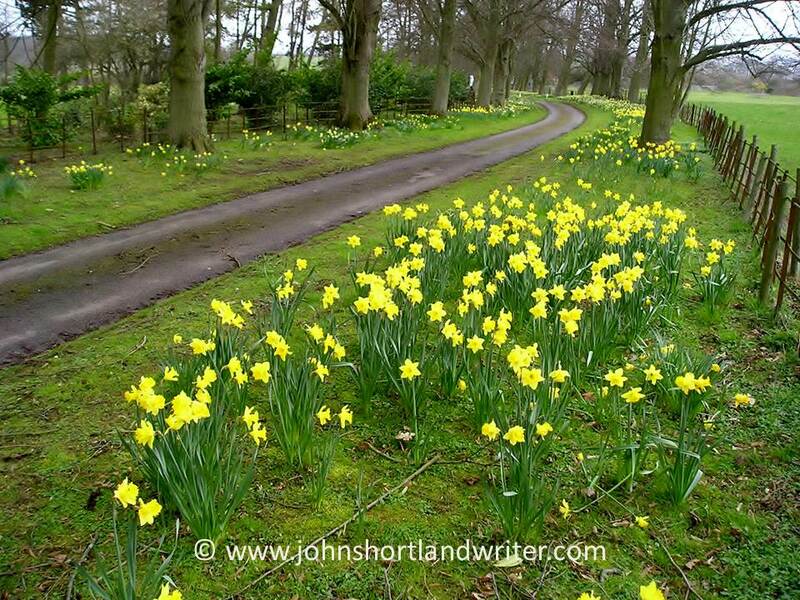 John Shortland is the author of Why Can’t My Garden Look Like That? a jargon-free and easy to read gardening manual, available from Amazon and good bookshops. To take a peep inside click on the image below.